I am not alone; you are not alone. God takes companionship serious. We serve a God fiercely committed to those who trust him with their lives. Whether we are in the heights of heaven, the depths of hell, or somewhere in between we are never beyond his reach or distant from his thoughts (Psalm 139:7-12). The final words of Jesus, before ascending to heaven, were his promise to never leave us (Matthew 28:20). His pledge of eternal companionship is not just a sentimental Christian belief, it is the consequence of a historical event that really took place. And the two thousand year persistent existence of the church profoundly testifies to the living reality of a God who delights in being with his children. And today, Jesus’ pledge remains an open-ended invitation awaiting our response. I have found that it is one thing to profess the truth of this invitation and another to live like it is the cornerstone of our existence. It is so easy to take this great truth for granted when it is so frequently preached and nonchalantly admitted. But to bank our lives on this promise of divine companionship requires much more than quoting scriptures and singing songs about God’s faithful presence. We must experience his friendship in times and places where no other friend can offer the comfort we need. There is a necessary ruining we must all experience if we hope to gain what can never be shaken—a faith grounded in the intimate fellowship and love of God. For in such valleys we discover who or what are our “actual” comforters. Despite our doctrines and confessions of faith, it is where we turn for solace in these times that reveal what we actually believe about God’s ability to care for and nurture broken souls. Suffering is never easy and the problem of theodicy is a troubling mystery to finally relinquish to God. But if we can, we will never be sorry we did. For our Lord stands by his name, Emmanuel—always and ever God with us. 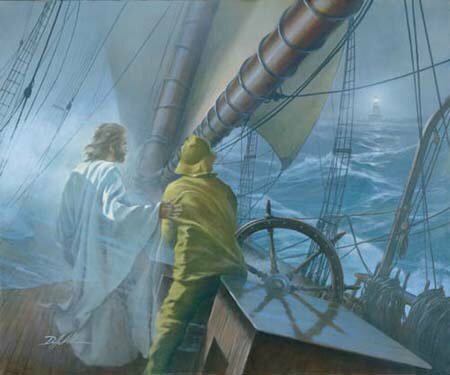 In our storms, if we can quiet our hearts and listen we will find that in the wind his voice is now drawing, drawing us and asking us to trust him with all we hold dear. Yes, we will suffer, it is part of the human experience. We will also be ruined one way or another—ruined for all else but God or ruined by broken hopes this world has falsely promised. It’s our choice and he has already extended the invitation. Next week we consider the attitude of hope that comes from the ruining we have discussed. Have you ever experienced the ruinous drawing of God? How did you respond? What did you experience?